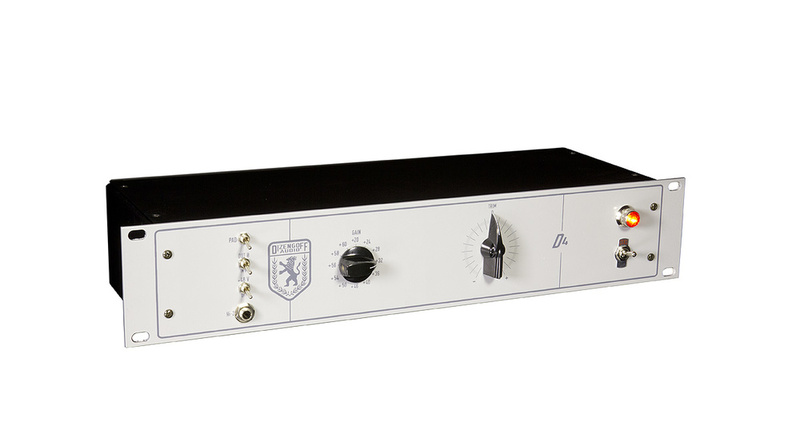 Dizengoff Audio’s D4 is a single-channel mic preamp based on a design created by EMI’s in-house Recording Engineering Development Department, as part of the development of the REDD.51 tube console. Although also installed in various other EMI studios, the REDD.51 was made famous by its tenure in Abbey Road’s Studio 2 from 1964 to ’68, where it was used to record the Beatles and Pink Floyd, amongst others. Dizengoff’s aim “to build affordable tributes to classic recording gear based on the original circuitry but with a Chicago-inspired twist” has resulted in their D4 being a re-engineered and expanded version of the original EMI design, rather than an exact clone. On the left of the 2U front panel is a vertical line of three toggle switches that activate a 20dB input pad, reverse the polarity of the input signal and route 48V phantom power to the rear-panel transformer-balanced mic input, which is located next to the transformer-balanced line-level output. A quarter-inch jack socket, sitting just below the toggle switches provides a high-impedance instrument DI input. The original EMI-designed circuit provided only three switched input gain settings (+36, +40 and +46 dB), but the D4 offers many more: there are 12 steps between +20 and +60 dB. These rise in five +4dB steps from +20 to +40 dB, followed by three +4dB steps from+46 to +56 dB and two final +2dB steps to the maximum +60dB. The Trim control, carried over from the original, enables you to increase or decrease gain by approximately ±2-4 dB at each step, the precise amount depending on the position of the Gain switch, and this gives the unit an effective input gain range of +16 to +62 dB. The D4’s circuitry consists of two circuit boards, one carrying the power supply, with its Nippon Steel R-core mains transformer, and the other the two signal transformers, twin tubes and associated audio circuitry. The input and output transformers are based around the specifications of the originals but were custom designed, and are being made in Chicago as part of Dizengoff’s laudable efforts to use as many locally sourced components as possible. The overall build quality is exceptional, and the components are of a uniformly high standard. The tube complement comprises an EF86 low-noise pentode in its first stage, followed by a E88CC double triode driving the output, and both appear to be of modern Russian manufacture. The manual suggests that NOS versions of either valve or their equivalents could be fitted as upgrades, whilst warning that, due to the unit’s high supply voltage, an ECC88 cannot be used to replace an E88CC. But before spending an additional £150$175 or so (at today’s prices) on NOS replacements, it’s probably worth noting that the D4 has a specified frequency response of 20Hz to 60kHz, a signal-to-noise ratio of -90dB at +60dB of gain (10-24kHz bandwidth) and a THD+N figure of one percent at 1kHz (+4dBu, 10-24 kHz bandwidth). Like its hi-fi equivalents, a tube-based microphone preamp is capable of displaying a high level of fidelity, and the Dizengoff D4 is no exception to that rule. With an AKG C414 B-ULS condenser mic, the D4 produced a clear, detailed delivery that possessed a solid weight in the bass, precise delineation in the mid-range and a crisply etched treble across a range of acoustic stringed instruments and percussion. My vocals were also handled with a precision and depth that made singing through the D4 a very enjoyable experience — for me at least, although I’m not sure about my neighbours! Winding up the gain revealed the D4’s ability to add an extremely musical sense of colour as its preamp was driven harder and distortion rose. Getting the amount of colour and dirt exactly right is simply a matter of getting into the zone with the coarse steps of the gain control and refining the sound using the trim, although the absence of an output attenuator means that you may well have to compensate for the increased level at your console or audio interface. Plugging into the D4’s front-panel high-impedance jack socket does not disable the rear-panel microphone input, which is a bit of a pain. Although this input is certainly very effective on electric bass, and on electric guitar you can get a pleasing amount of crunch from a humbucker, it doesn’t have anywhere near enough gain to give you John Lennon’s distorted ‘Revolution’ guitar sound — but since Lennon’s aforementioned distortion was reportedly created by daisy-chaining two REDD.51 modules together, putting another mic preamp (I suppose another D4 would be ideal) in front of the D4 should give you the opportunity to create your own approximation of Lennon’s sound. Since it’s so quiet, precise and musically colourful, its -20dB pad will should enable you to run a mix through the D4, should you be looking to add a little extra something — which gives you the excuse you need to buy the two D4s you’d require to process a stereo mix! The Dizengoff D4 is a superb tube-based microphone preamplifier that, despite (or perhaps because of) its innate valve- and transformer-derived sonic character, is more than capable of holding its own in performance terms in this age of digits and solid-state electronics. This shouldn’t come as a great surprise to anyone as the D4’s inspirational antecedent was designed for use in classical recording, not just for pop sessions. As with Dizengoff’s DA2 (reviewed in SOS January 2018), I can easily envisage a pair of these as my main mic preamps and make-up gain devices for my passive analogue summing mixer. The high fidelity of which it’s capable, its ability to add musical coloration, the quality of its overall audio presentation and the attractive price-to-performance ratio should put the Dizengoff Audio D4 on the audition list of everyone searching for a microphone preamplifier at around or above its price.